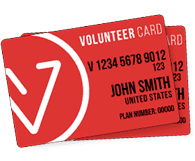 Who qualifies for a Volunteer Card? Any individual taking a trip for the purpose of volunteer organization projects, non-profit organization projects or educational projects. How do you verify that an organization is a legitimate non-profit? We use GuideStar and CharityNavigator to prove the legitimacy of volunteer and non-profit organizations. Can I purchase a Volunteer Card if I'm already traveling abroad? The Basic, Plus, Premium and Trip Cancellation and Interruption travel insurance policies must be purchased prior to departure. The 365 Plan can be purchased after you have departed on your trip. I'm leaving on a trip very soon. How long does it take to receive my card? Immediately after purchase, we will send you an email with your travel protection code and an e-card. At this point, your travel protection coverage is activated (and you can leave on your trip with no worries). It usually takes 5-7 business days to receive a hard copy of your card in the mail. Why is this so cheap?! Many people are flabbergasted when they see how cheap the Volunteer Card is and think there must be some hidden costs. Rest assured – there are none! Our founder, Ryan, had working relationships in the travel industry and was able to negotiate special rates specifically for volunteers. How do I gain access to the discounts? After you purchase a Volunteer Card, you will receive your account number via email. You will use this number to create a username and password on our website and gain access to a variety of discounts. Are these discounts just for volunteer-related activities? No. You can use these discounts for any purpose for the entire year of your membership. Yes. Both the toll-free number and the international collect number (located on the back of your Volunteer Card) are completely free of charge.. Simply email contact@volunteercard.com and ask for the renewal link. Who do I contact if I am having technical problems with signing in? The Basic, Plus, Premium, and Trip Cancellation and Interruption travel insurance policies are underwritten by Arch Insurance Company,NAIC#11150 under form series LTP 2013 and amendments thereto. The 365 Plan is underwritten by IMG. Is Trip Cancellation and Interruption coverage included with the Volunteer Card? Trip Cancellation and Interruption is not included with the travel insurance plans, but it is available to Volunteer Card holders as an add-on. Trip Cancellation and Interruption costs 5% of up to the total cost of your trip. Will I have coverage on my trip if I only have a one-way ticket? A one-way ticket implies that you have the intent to return back home. A one-way trip is someone that purchases a ticket with the intent of staying/living at that destination. Coverage will still apply for those intending to return home even if they’ve purchased a one-way ticket. If you are not satisfied with the 24/7 assistance, discounts, or level of travel protection coverage, within 14 days of purchasing this plan, we will refund your plan cost if you have not departed on your trip or filed a claim. Yes. We would never share your information with third parties. We do give your information to our insurance underwriter, but they will never contact you unless it is regarding your policy. Everyone on the Volunteer Card team has personal experience in humanitarian work, having served in over 50 countries combined. We are uniquely positioned to serve the humanitarian community because we are committed and involved ourselves. We donate a significant portion of our proceeds to humanitarian projects, particularly in Southeast Asia through the nonprofit 501(c)(3), Venture. Feel free to contact us. You can call us at 877-865-6877 or e-mail contact@volunteercard.com.